How to Merge, Join and Combine MP4 (MPEG4/H.264 Codec) Video Files on Windows 10/7 PC? Merging multiple MP4 video files into one is a smashing way to make self-made movies (for sharing or uploading to YouTube, for example) or combine several episodes of a TV series. No sophisticated technology is needed to achieve this, and there are many tools can merge MP4 files. However, most free channels will wipe the smile off your face. - The files to be merged must have the same format (such as MP4 file with the same codec), file size and frame rate. It is way harsh because it is almost impossible to meet this requirement. - The size of MP4 video file is limited to 200M, which defeats HD video recording and movie merging. - The merging process is quite slow. It is frame by frame technique that seems to be used, which make it extremely time consuming. - Even after repeated tries, it still fails to merge MP4 video files. Turning to MP4 video merger programs seems a better idea, but there are still shortcomings in some tools, for example, VirtualDub doesn't seem to support MP4 format, FFmpeg is difficult to process the command line, and not a few freeware programs have adware or other unpleasant plug-ins. Besides, plenty of video joiners get stuck or run slow on Windows 10 OS. How to easily merge MP4 video files on Windows (10) free and fast? WinX Video Converter [100% clean freeware] Merge multiple video files into one. No input formats limit. Add several MP4 videos and merge into a new MP4 file or convert to other video formats based on needs. No quality loss. Also, convert any other videos from one format to another. User Guide: How to Free Merge MP4 Video Files into a Single File on Windows 10/8/7? 1. Input server video files for merging. After launching the free video merger and converter software, tap "+Video" button on the top left, browse and choose one or more video files at one time from your computer. You can add MP4 and any other formatted video files. • HD-Camcorder/drone Videos: JVC (*.mod, *.tod)/Sony (*.mts, *.m2ts)/Panasonic & Canon camcorder video, Gopro, DJI drone videos, etc. 2. Choose MP4 as output format. 3. Check "Merge" item on the right. On the right of the main interface, click to check the "Merge" option on the right. 4. Change the video sequence. You can adjust the sequence of the video files you added, or delete any of them to disable its merging. Sequence: move the mouse on the file you want to adjust, click Up or Down icon on its right to move up or down. Delete: move the mouse on the file you want to adjust, click Trash Bin and the file will be removed. 5. Set up the merged MP4 file. On the top of the video section, click the Settings icon and make adjustments of video audio parameters according to your need. 6. Edit the video files. You can edit any file by clicking "Edit" icon, say, adjust Audio Volume, add subtitle, crop, expand, trim the video. Note: This action is conductive only before you checking "Merge". If you want to edit each video, you should uncheck "Merge" first. 7. Start merging the video files. Hit "RUN" button on the bottom right. After seconds, you can get the merged MP4 video file in the destination folder you set on your computer. Why Do Most People Choose This Free MP4 File Merger? Uniquely, it has in-built High Quality Engine and De-interlacing Engine to make sure the image quality of compressed MP4 file is optimal. Natively supporting Microsoft Windows 10 OS, it performs perfectly in merging and joining MP4 files on Windows 10. It is also the best free video converter Windows 10, the best free Windows 10 video editor, as well as the best free Windows 10 YouTube downloader. • It is 100% clean, safe and free. Unlike some other freeware, WinX Video Converter contains no adware, ransomware, malware or virus at all. VideoProc is the advanced edition of WinX Video Converter. It is the only level-3 hardware accelerated video converter, fully supporting Intel QSV, NVIDIA CUDA/NVENC hardware decoding, processing and encoding. It can handle your videos in all-sided way as follows. • Convert any video formats to other formats, supporting 370+ video & audio codecs. • Have 410+ build-in profiles for different devices, websites, apps, etc. • Download 8K/4K or 1080p/720p videos, 3D/VR movies, MP3 songs from YouTube and 1000+ sites. 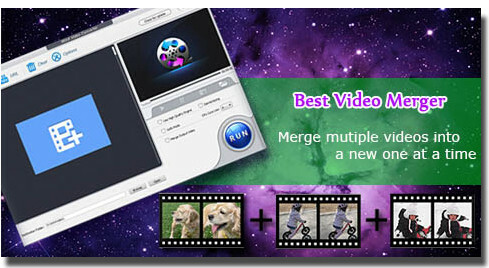 • Merge, cut, crop, trim any video files, add external subtitles. This article will lead you to free download the best video joiner for PC/Mac and give a thorough user guide. You don't need a high end video editor to split and merge video files. We have compiled the best and easiest apps that anyone can use to do this simple job. How to repair corrupted MP4/MOV file on Windows/10 or Mac? Is there any free MP4 video repair software? ThisMP4 file fixing guide will show you best video repair tool. Part 2How to Merge MP4 Videos into a Single File on Windows? Part 3Why Do Most People Choose This Free MP4 File Merger?